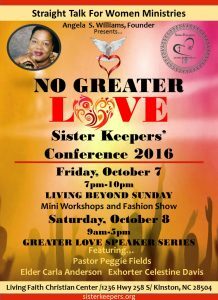 Due to the threat of inclement weather and the State of Emergency issued for NC for this coming weekend, we are cancelling Sister Keepers No Greater Love Conference 2016 scheduled for Friday and Saturday, October 7th and 8th. We want to thank all of the patrons, participants, presenters, workshop leaders and speakers, who have expressed their continued support as we seek a new date. 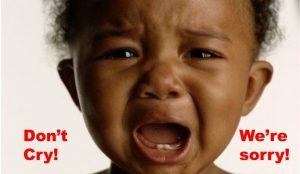 If we have not contacted you personally and you have any questions, please contact us through our website contact form at http://sisterkeepers.org/ or email us at sisterkeepers4u@gmail.com. Hope to see you all at the conference at our new date. 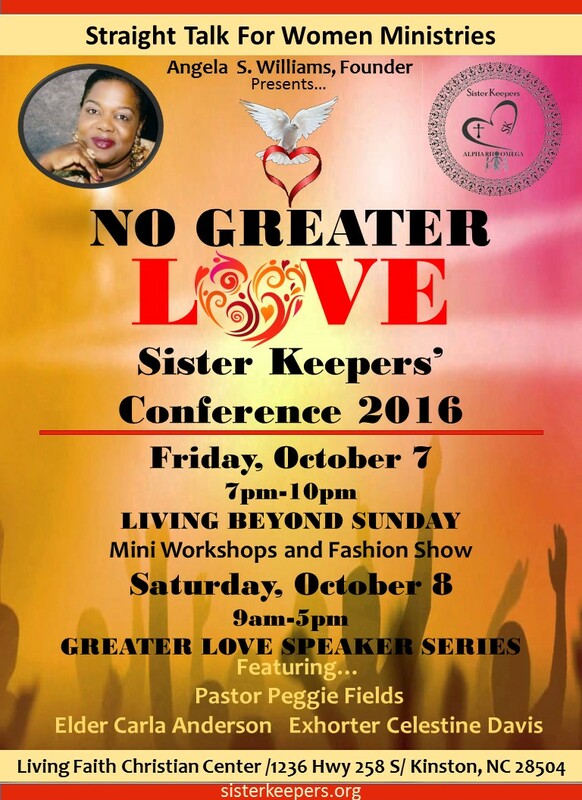 Sister Keepers’ No Greater Love Conference 2016 is coming October 7th and 8th! This women’s conference will address issue facing the whole woman from a biblical and practical points of view. This event will provide attendees with proven ways to concretely change their lives in meaningful ways. Friday night from 7-10 pm come on out to enjoy and participate in event as we present experts in our event, Beyond Sunday in Faith, Food, Fitness, Finances, Fashion. Yes, there will be fashion show! All mini workshops and presentations will provide you with tools that you can use right now! Read about the speakers Pastor Peggy Fields, Elder Carla Anderson, and Exhorter Celestine Davis for this year’s events on our blog.